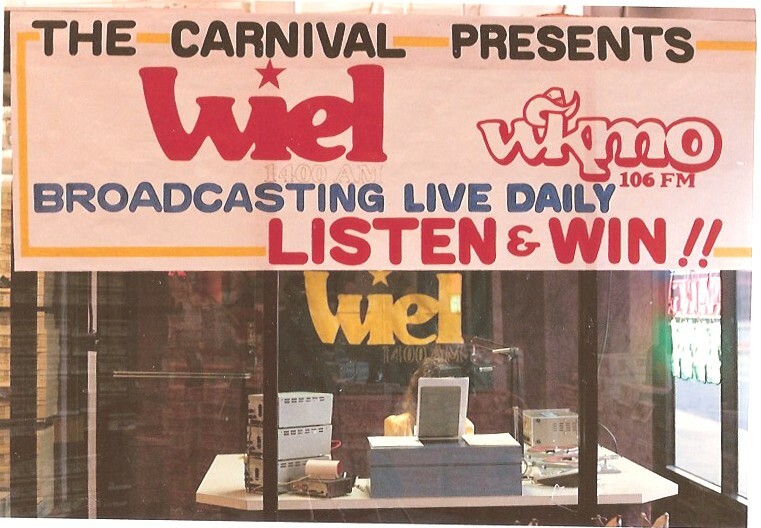 On September 28, 2000 WIEL Radio in Elizabethtown celebrated a 50th Anniversary. That event in itself is certainly reason for celebration. But in this fast moving era of radio stations that change formats and call letters almost weekly it is particularly interesting to note that they have maintained the same call letters since establishment. I have to admit an above average interest in radio (at least of the 50s thru 80s). My dad always told me I come by it from my mother. When I was very small my family lived in a second floor apartment. Seems neighbors downstairs objected to noises I might make, but didn't mind hearing the radio playing. So Mom kept it on all day long. Talk about subliminal brain washing. Having started in radio as a DJ (Disc Jockey) at the age of 18 in my hometown in West Virginia I eventually joined the WIEL staff on a part time basis while stationed at Fort Knox. We are not going to reflect on WIEL in the early 70s when I was part of the history. Instead let's go back to the beginning, in 1949 when a group of Elizabethtown businessmen petitioned the FCC for a radio station at 1450 KC. That request was refused, but the following year 1950, a station was authorized on 1400 KC at 250 watts. You probably have appliances that use more electricity. A small tract of land for the new station was purchased in April 1950 from HB Clark on US 62 a few hundred yards from the city limits. Work on the new state of the art studio facility was begun during the week of April 21st by Diecks Lumber Company. The owners were announced as Stokley Bowling, Holly Skidmore, Horace Tabb, J.W. Hodges and Clifford A. Diecks. Let's don't get too carried away, television was very much a problem at this time for some radio stations and theaters. Here in the Heartland of Kentucky, television sets were slow in coming. In those days, television was something you watched in the store window. Prices for a television set ranged from $188 to $407. This was out of the reach for the average citizen. A deluxe table radio typically cost about $30. Anticipation of the arrival of this modern miracle in the local community ran high. Inside The Turret, a Fort Knox newspaper, gave a fairly complete announcement of the new facility in its August 17th issue, stating "The opening of this station will be of considerable importance to Fort Knox since the post is located well within the broadcast range of the station." The newspaper informed readers, "The management has given assurance that news concerning Fort Knox will be broadcast regularly in close cooperation with the Public Information Office and this station has been assured. The station will afford an excellent medium for the dissemination of Army information to Elizabethtown and vicinity and by strengthening the bond of community friendship for all concerned." These were great expectations which were actually realized many times over the following years. As soon as the station was on the air, fifteen minutes programs of Fort Knox news (Knick Knacks from Knox with Rick Richardson) were aired about three times a week. Fort Knox sports became a popular item for the new station. One year after being on the air, WIEL was sending sports crews to the some of the farthest originating points from the station in an effort to record every game by the Ft. Knox Tankers football team. The station's crew went to Keesler Air Force Base at Biloxi, MS and San Antonio, TX during the 1951 season. Recordings of the games were broadcast on the Sunday afternoon following the weekly game. Ft Knox's Rick Richardson was at the mike for these broadcasts. But we're getting ahead of the story. frequencies was necessary because the paper stated the new station would have 1400 KC on the dial which was then occupied by WGRC in Louisville. and tower from New Albany, where it was boasting 1000 watts at 1400 KC to Jeffersontown in Kentucky, along with a switch in frequency to 790 KC. would eventually become a legendary Louisville station, WAKY. But that is still another story. 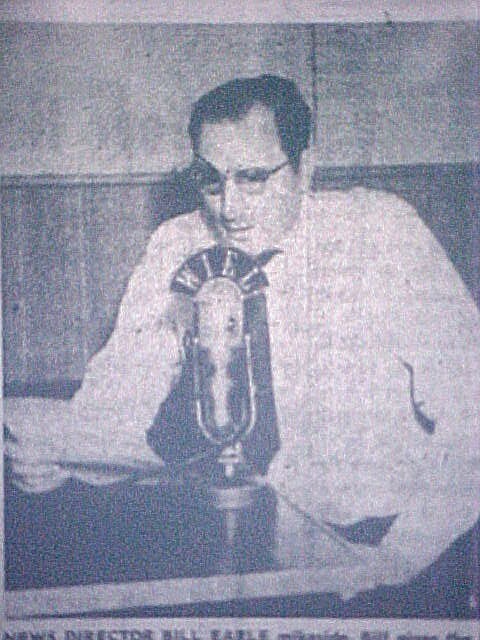 The following day, the Elizabethtown News story carried the headline, "Radio Station Soon To Open - WIEL Will be On Air Waves Maybe Today" the story recounted the same basic information as the Hardin County Enterprise. In anticipation of the coming of the new radio station, S. B Goodman, editor and publisher of the Hardin County Enterprise wrote in an editorial in the September 18th issue: "Welcome WIEL-The Hardin County Enterprise welcomes station WIEL to Elizabethtown and extends best wishes for its success. The Elizabethtown trading area is large enough and prosperous enough to support such a station. It will be a valuable medium for the dissemination of news and entertainment." The newspaper went on to say, "A radio station can be an influence for good in the community it serves. Knowing the character of the men who are behind the local station, there can be no doubt that such will be the case here." Glowing words for sure, but there was silence on the air until around noon on September 28th when WIEL joined the ranks of numerous other small town stations coming on the air during that period in our country's history, just following World War 2. The Elizabethtown News on September 29th reported a description of the new stations, historic sign on. "An opening talk was made by Mr. Harris and Dr. L. E. Martin. The first program was one of "Hill-billy" music". The Tuesday October 3rd issue of the Elizabethtown News featured welcoming remarks by its editor W.H. Marriott writing "Of course a "new broom sweeps clean," but a good reception has greeted the radio station in Elizabethtown which opened last Thursday. It has created considerable interest among folk in the town and county." The editor rightly pointed out that all broadcast business ventures are the result of "the spirit of enterprise and the investment of venture capital by the five more or less young men who own it." Local advertising in all local media took a more "radio" oriented slant than previously. Modern Electric Store and others purchased newspaper space to advertise the features of their radios currently in stock. One such ad for the General Electric Clock Radio, "Lulls you to sleep with music" turns itself off and then on automatically and "Wakes you up with Music!" Available in brown, ivory, red or porcelain white plastic cabinet for the low price of $34.95. Not to be out done, Hardin Furniture Company on West Dixie advertised, "Enjoy Your Radio - The World's Best Music and Entertainment and all the Latest News Comes Over It." But music and news wasn't the only thing on the radio in those last seconds of "Radio's Golden Era." Religion took to the radio immediately as a way to spread the Gospel. Severns Valley Baptist Church held revivals with Rev J.G. Cothran of Arkadelphis, AR and broadcast a morning devotional over the station from 10:15 to 10:30 am daily except Sunday. Evanglists L.G. Hoover and Estel Beeler started regular broadcasts on Friday afternoon October 20th at 5:30 pm. WIEL, under the management of Bill Harris, established a regular block schedule of programs sponsored by local businesses. Some of these included, "Swap Shop" each Tuesday, Thursday and Saturday at 8:30 to 8:45 am sponsored by Lincoln Loan of Elizabethtown. First Federal Savings and Loan had a five minute program Mondays, Wednesdays and Fridays at 6:30 pm, but history does not record the contents of the program. Elizabethtown's three motion picture theaters presented "Movie Mirror" every evening from 6:35 to 6:45 pm. Probably a roundup of the movies currently playing in town, hoping to lure residents to the evening performances. 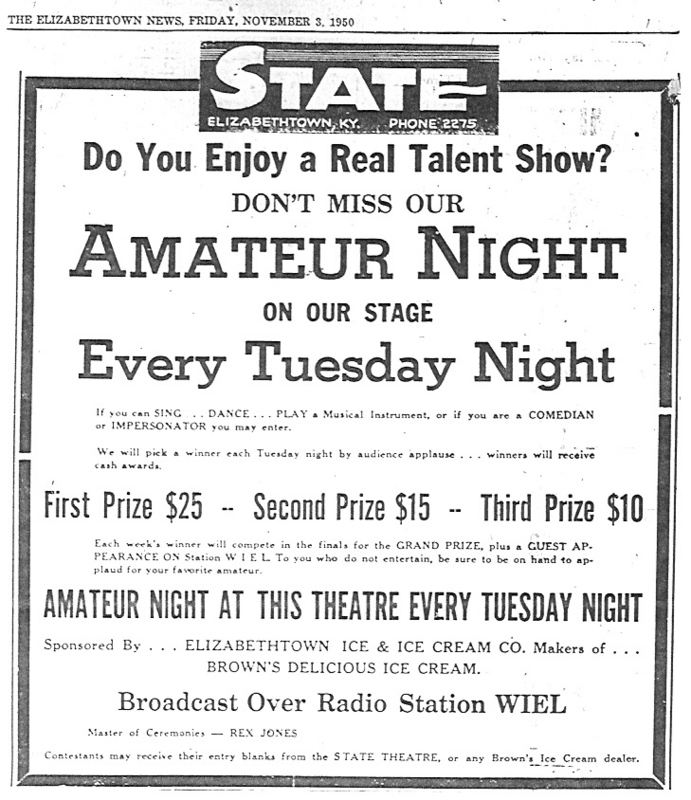 The State Theater held an "Amateur Hour" contest show every Tuesday night starting on November 7, 1950 sponsored by Browns Ice Cream. The contestants had a chance to win one of three weekly prizes of $25, $15 and $10. Naturally the "Amateur Hour" was a remote broadcast live every week on WIEL from the stage of the State Theater with Rex Jones serving as Master Of Ceremonies. The Grand Prize included a guest appearance on Station WIEL. WIEL placed advertisements inviting the local population to stop by the studios and watch their favorite show being broadcast. Like most businesses, the station was on the air for a short period before holding a "Formal Opening" broadcast, held on Sunday afternoon, October 22th. Live from the studios local residents heard a program of speeches and singing. According to newspaper accounts of the period, welcoming remarks to the listenership was presented by Dr. L.F. Martin of the Ministerial Association; the Commanding General of Ft. Knox; Judge J R Layman; Mayor Harry Miller of Elizabethtown; Ed McCullum president of the Elizabethtown Chamber Of Commerce; County Judge W.S. Long; Mayor George Cooper Of Vine Grove; Mayor Claude Polley of Hodgenville; Mayor Frank Wilson of Bardstown. Songs were provided by Joy Bale; the Kentucky Rhythm Boys; the Melody Airs; The Lincolnaires and a selection by the Fentress twins. Introductions of the staff was given to: William "Bill" Harris, Rex Jones; Russell Honeyman; Chuck Hardin; Tom Baldwin; Burnette Day; Eugene Hornback; Lester Entringer; Shirley Belt and Rita Hays. Newspaper Advertisement for the New Station! newswires. This was before most baseball owners allowed live on-the-scene broadcasts of games. surprises as Harvey dug into stories behind the stories of famous events and people. the conventions received 22 special reports each day from the convention floor.